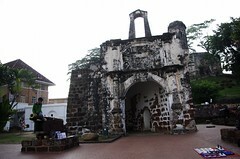 Yes, we all know the Portuguese came and conquered Malacca in 1511 â€” but did you know that they tried to take the Sultanâ€™s magnificent bed back to Portugal? This year marks the quincentenary of the capture of the famously-rich and thriving port back in 1511 by the second Viceroy of India, Admiral Alfonso de Albuquerque. Of course, anyone who has ever gone through the Malaysian school system will know that date, and the events and consequences of the time the â€œwhite manâ€ came to these shores. But behind the sweeping events on historyâ€™s stage are intriguing nuggets known mostly to historians or students of history alone. For instance, according to the Portuguese, Sultan Mahmud Shah, the then ruling Sultan of Malacca, was an opium addict! Though the The Malay Annals (Sejarah Melayu) does state that he was also fond of literature and studied religion….